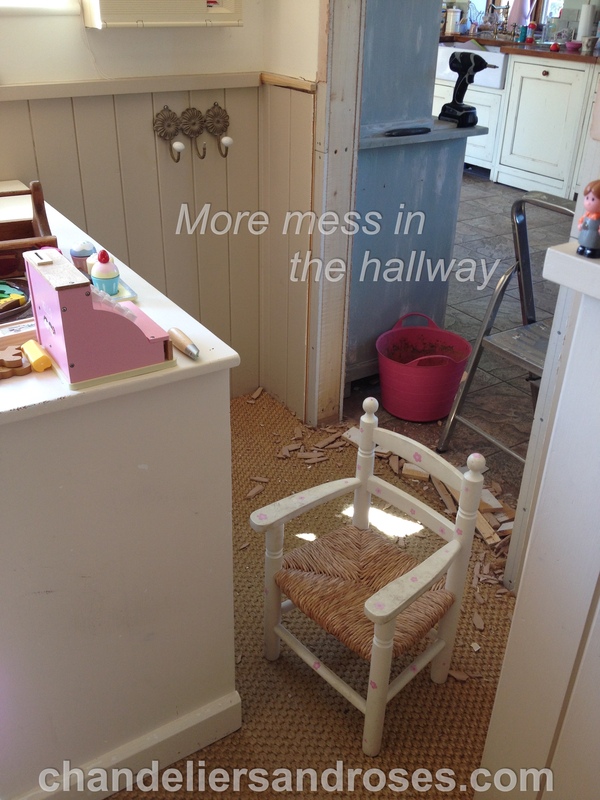 House Renovations and Living in chaos! 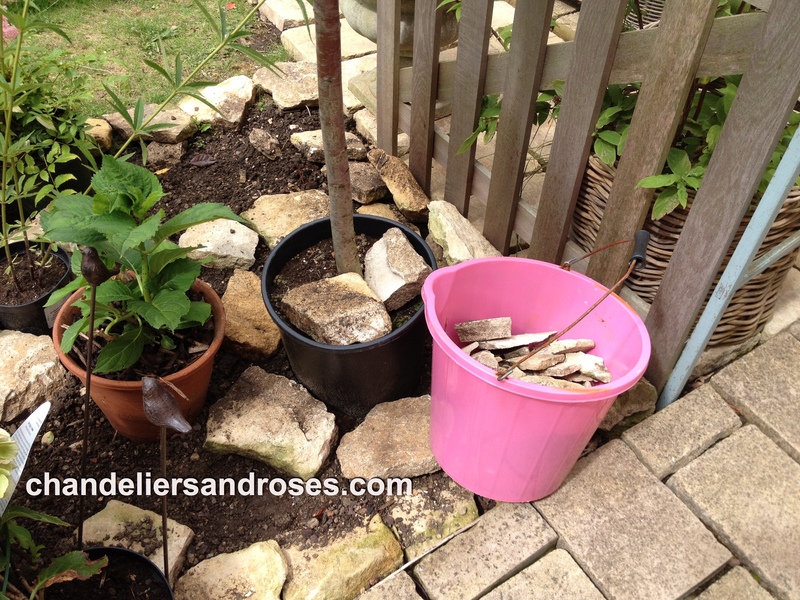 Whilst you may, or may not, have been enjoying the spring and summer so far, I have been just a little bit busy. 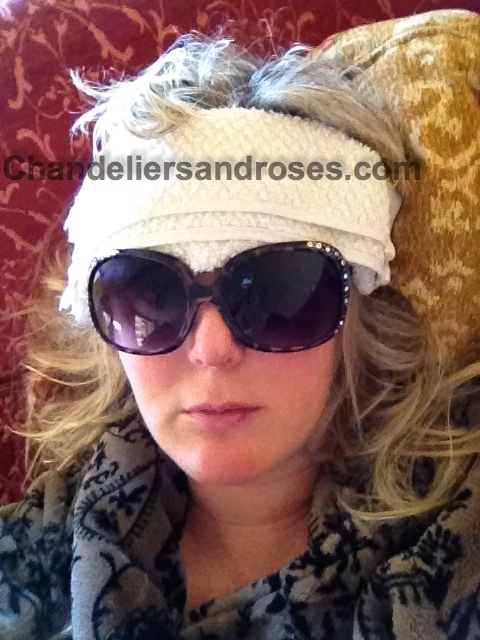 Firstly, disaster struck – this is a photo of me taken by my children whilst I had flu some weeks ago – I know it is a little scary but I was really quite ill. That is a cold flannel on my head as I had a temperature of over 100% and the sunglasses are because the daylight was really hurting my eyes! Not a good look! It took about 3 weeks to feel normal again and I can’t believe it went on so long, but I did look up which foods would help and they were raw onion, raw garlic and berries, amongst other things, so I kept trying to eat them in whichever way I could – hmmm, what do you mean what about my breath, it was fine – Really!!! 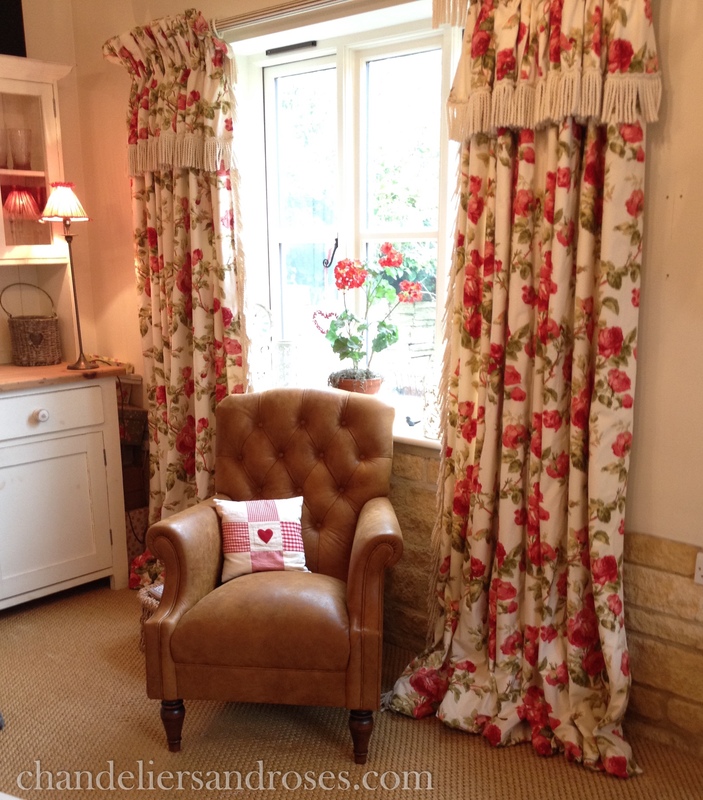 Ok, so once I recovered I made up for lost time and Mr Chandelier and I went into ‘Demolition Mode’! 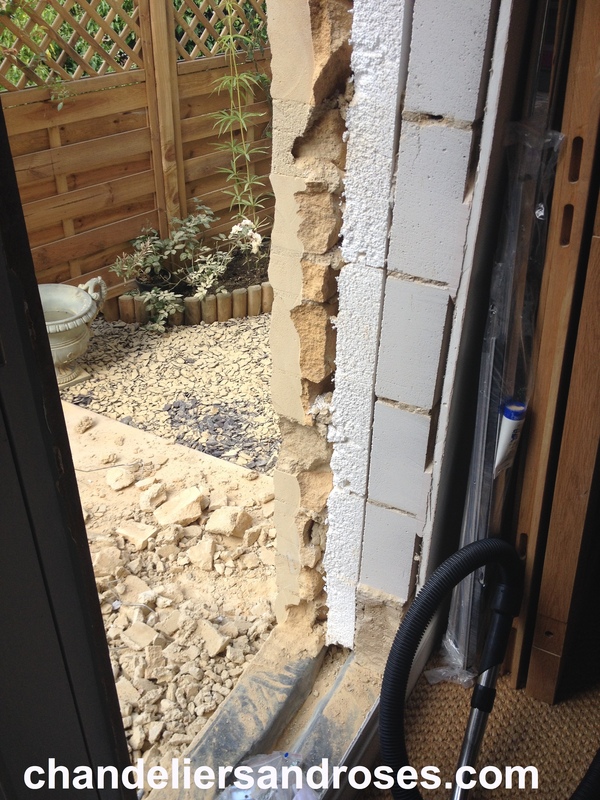 We started by taking down this wall in the main bathroom – you can see the new wall we have built on the right of the photo. This corner is where our new shower will go. 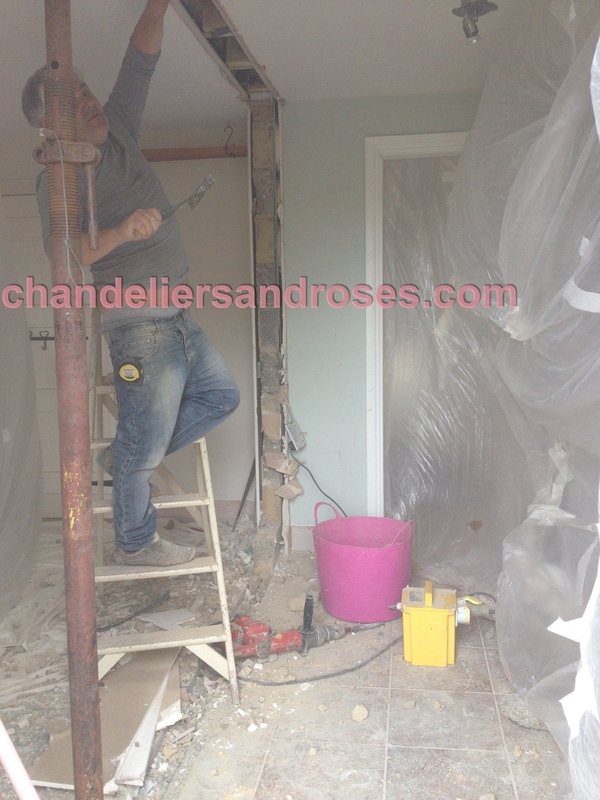 Then we knocked down this wall – (I know what you’re thinking but Mr Chandelier wanted to do all the remaining demolition whilst we had a very large skip outside and frankly, I am so not complaining as things are moving on at a rapid pace and I’m loving it – although not the dust obvs! 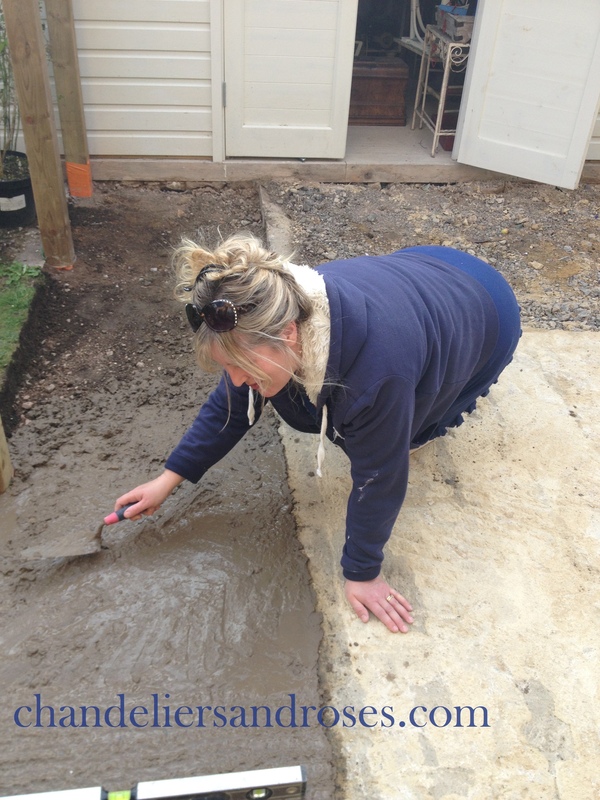 It was a very long and very dusty day – that is dust in the photo – and just a tiny little bit of cursing was heard that day! 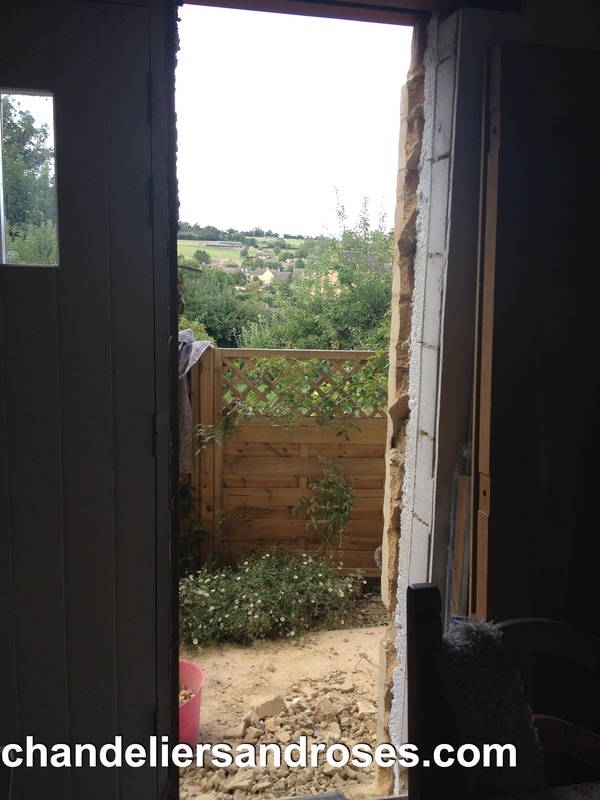 This is actually the wall between our kitchen and our little snug, which I am really sad to lose, but we just do not use it and we don’t have a large enough house to have wasted space. This has of course, had a knock on effect in the hallway because the doorway you see in the above photo goes through to the hall and we are going to block this up and turn the other side, in the hall, into a large cupboard for coats, shoes, beach bags, garden cushions and anything else I can shoehorn into it, which you need with a family of 5 – especially when one of them has rather too many of all of the above – not mentioning who that is of course! 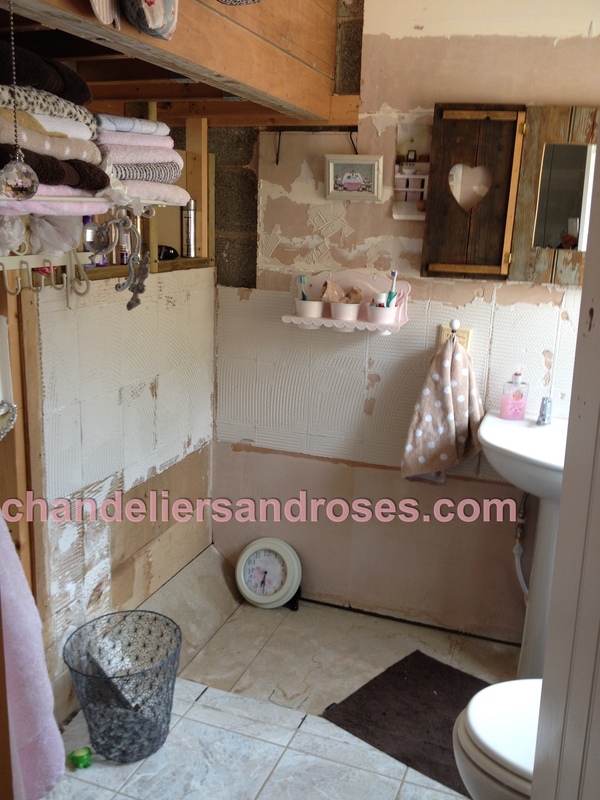 Then, having cleared up for eveeer, we did some demolition in our en-suite, ripping out the bath – which remained in my bedroom for at least a week, (not really sure why!) 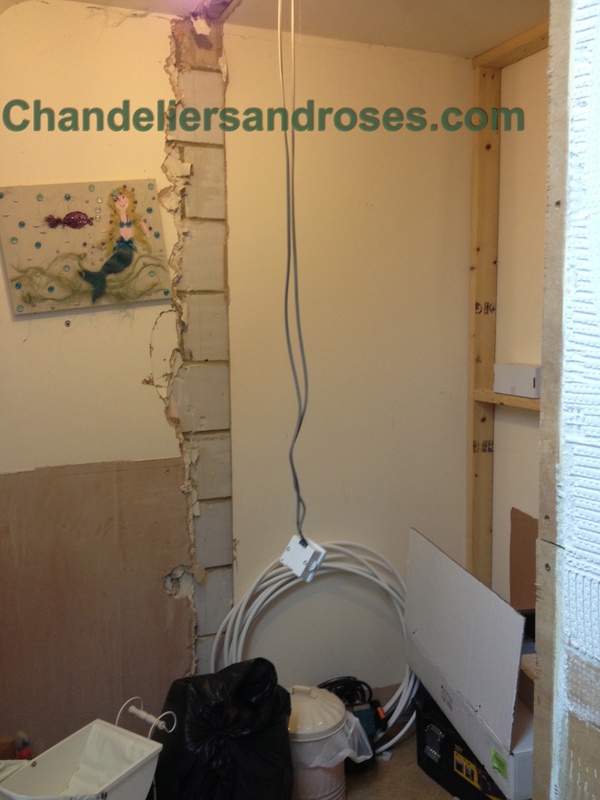 – and tore down all the wall tiles and other rubbish and temporarily moved the sink until we do this room properly. Now I do understand that at this point, with so much chaos everywhere, most people would, having firstly seen their doctor for some tranquillisers, have stopped right there. BUT NO. 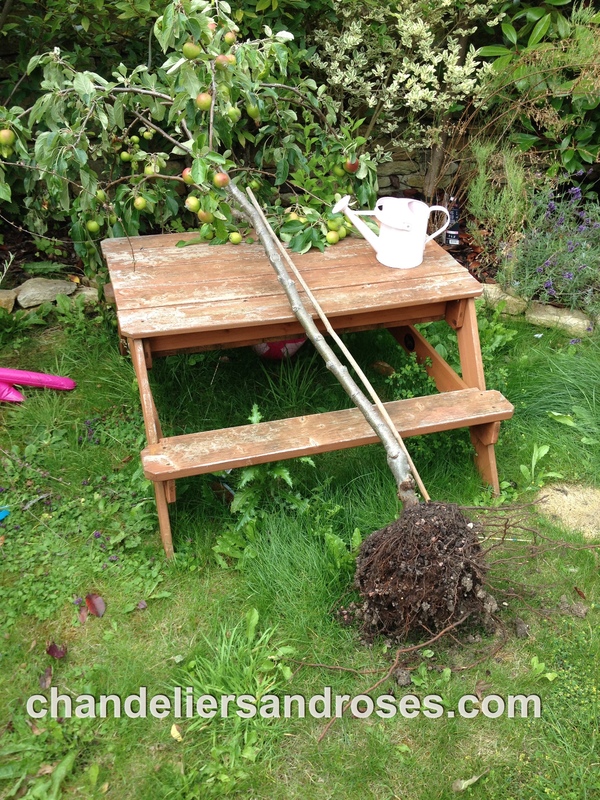 We are not most people, I obviously have some sort of psychological disorder because I just moved straight on in to the garden as I had to demolish flower beds and move trees and plants and it has rained on and off for days and now, I literally have trees on their backs and plants and soil and chaos everywhere! But, – it’s ok – because things are happening. 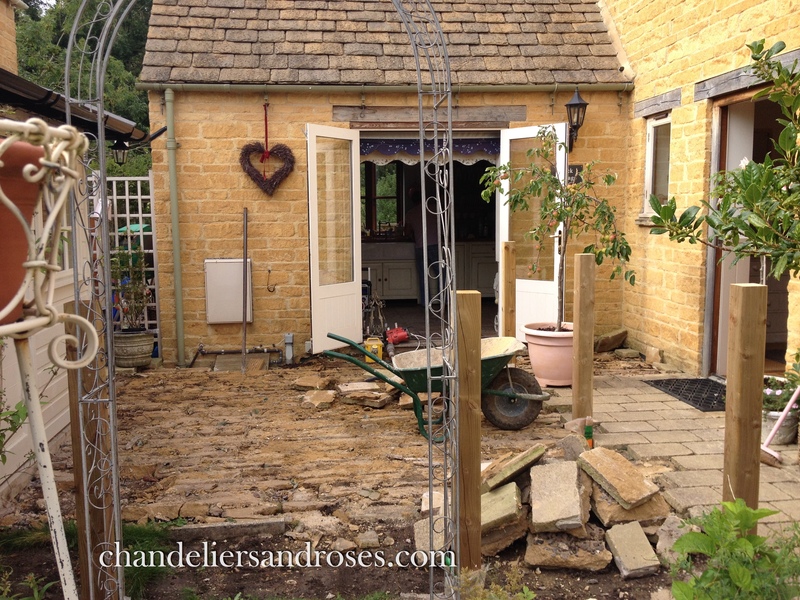 Every single day something changes or moves forward and I have spent the entire day today spring cleaning my kitchen / diner / snug / building site, which will of course be fabulous when it is finished. Don’t ask when that will be as I’m not allowed to ask that question – you will get the same answer as me – “It will get done when it’s done’! We have ordered the flooring, due August, and some oak french doors which arrived today, but the glass was smashed by the courier, unbelievable, especially as we went to a lot of trouble making sure Mr Chandelier was here as he mostly works away all week. Just keep smiling, especially when your toddler has trashed the hall, lounge and your bedroom whilst you have been spring cleaning your kitchen and try really hard to just LAUGH LOUDLY when Mr C tells you he will be using some big fat dusty power tool in the next couple of weeks to carve the kitchen wall into a nice tidy flush brick line….Grrrrrrr!!! Gin anyone?